Central Texas was once known for its meat market-style barbecue joints, i.e. meat markets that had a barbecue business on the side. Many of those places are gone, or they have converted into barbecue-only businesses. A few holdouts remain, including one shining example: the Thorndale Meat Market. About an hour northeast of Austin, out on Texas Highway 79, the tiny town of Thorndale is like many small towns in Texas. A few residential neighborhoods, a couple of gas stations, a couple of antique stores, and a smattering of other small businesses. Including Thorndale Meat Market, run by Frank “Trey” Felton III. He bought the business from his grandfather and upgraded to a new building in 2011. Inside the store, shelves are stocked with snacks and drinks, and a glass case at the back of the store displays the specialty of the market: the meat. It’s here that you’ll find their signature sausage (the type smoked at Stiles Switch BBQ & Brew in Austin and Meat U Anywhere BBQ in Grapevine), thick-cut steaks, and even smoked pies. Dried sausages hang from above like motionless wind chimes, and a large menu on the back wall lists all the barbecue options. The menu is new, and the greater focus on barbecue began a couple years ago, according to Felton. Before then it was more of a hobby. Leftovers would be cooked directly over coals and sold as just another meat market item. 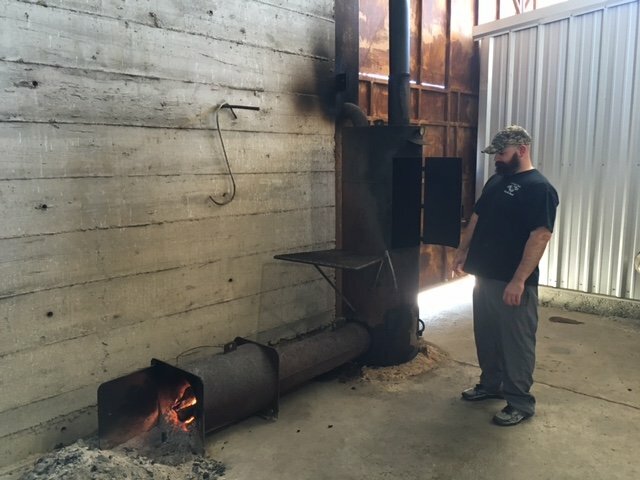 Felton wasn’t in love with the results, so he modified the pit into an offset smoker. Now all the meat is smoked. And it’s not just leftovers. A stock pot full of mop sauce stayed warm on the fire box. A mix of vinegar, mustard, lemons, and black pepper not only flavors the barbecue, it helps keep the meat moist during cooking. Yet what is intended to be an extra layer of flavor, however, becomes the dominant one. My guess is that the mop sauce is a holdover from when they cooked with direct heat. That style of cooking is a good way to dry out meat, especially big cuts like brisket, and the mop sauce combats that. The direct heat also helps cook the sauce into the meat, but that same searing action doesn’t happen when indirect heat and smoke are wafting over the surface of a brisket or ribs. What is left is a very prominent, sometimes overwhelming, mustard flavor. I must admit, I wasn’t certain whether I liked it or not. I enjoyed the tang from the mustard, but it was hard to taste anything else. There was no nuance or melding of smoke, beef, and salt. It’s the sort of boldness in flavor that you’ll find in South Carolina mustard-based barbecue. Someone tasting that for the first time, who is used to sweet barbecue sauce, might be taken aback. Maybe Felton will one day be known as the founding father of a whole new branch of heavily mustard-mopped Texas barbecue, but for now I think he uses too much. The brisket on two visits was on the verge of tenderness. I preferred slices from the lean side with a nice cap of tender fat. Felton did himself no favors from the tenderness aspect with very thick slices from the point. On my second visit it was almost as thick as the pork rib. As for those ribs? They also had the same mustard mop—it was especially heavy on the baby backs—but some sweetness in the rub helped to balance it out. The baby backs were also more tender than the St. Louis, but both could have used some extra time on the pit. From their smoked sausage reputation, I expected them to excel in that department—and they did. It was very juicy, coarsely ground, and pleasantly spiced. The sausage is smoked in a different smoker than the brisket and ribs, sharing space with thin cut pork steaks. I love pork steaks, and these were good, but I did miss the grilled flavor of a direct-heat fire. A dip in their thin, tomato-based sauce (served on the side) did wonders, though. There are several side dishes to choose from, but I went with the simple, but well-executed pinto beans and a fantastic chunky German potato salad flecked with bacon. The smoked pies beckoned from the case as well. They are cooked in the pits, but I wouldn’t describe the basic apple pie as smoky. Another specialty of the market is an array of dried sausages. The way they dangle above make them a more tempting impulse buy than any pack of gum. Felton warned that a landjäger (he has a few more options like chorizo as well) was still a few days away from being ready, but I promised to let it hang until it got dry. When I cut into it at home a few days later it was a nice reward for my patience. There was a great smoky flavor, a hint of sweetness, and a good black pepper bite. Dried sausage is like a mix between beef jerky and salami, and this one was better than either of those. I can’t wait to crack open the chorizo next week. I liked Thorndale Meat Market. The old pit, the fresh and dried sausages, and the link to the barbecue traditions of our past make a great stop for any barbecue buff. The barbecue is good too, and with some easy tweaks it could be great. From our discussion at the store, I know Felton has an inquisitive attitude about barbecue, and a yearning to keep getting better. That—and the prospect of more dried sausage—is why I’m looking forward to my next visit. Rockdale Meat Market has good bbq.. The man himself that MADE thorndale meat market years ago, John Ramirez, has the best Bbq around.. Check it out..